Blogging is one of the most satisfying ways of communication in the Internet era. It allows people to share their thoughts, expressions and knowledge, through words, images and videos, with the whole world. Those who have a creative aptitude and love writing, prefer this form of communication. And it is quite easy to start as well if you are a budding blogger. There are many popular blogging platforms available on the Internet today. And in this age of large-screen iPhone and iPad, blogging is no longer limited to desktops. Each blogging platform has its own dedicated mobile app as well for connectivity on the go. But thanks to the sheer amount of options available, it becomes very difficult for a new user to choose which platform is better for him/her and what blogging apps to use on their iPhone. If you are a new blogger and are facing such a dilemma, then this article will definitely help you select the best blogging platform. We will share some good blogging platforms and apps that might suit your need of writing sharing. Tips: If you lost any note or photo that is important for your blog, you can always use Gihosoft iPhone Data Recovery to get them back from iPhone or iPad easily. WordPress is the most popular platforms for bloggers. The desktop version is incredibly powerful and offers a lot of options for the power users. Even if you are a newbie, it is incredibly easy to use and navigate. It is very easy to start and blog and manage it. WordPress offers a great app for iOS which allows users to create new posts, edit previous posts, add videos, images to posts, respond to comments on posts and monitor blog statistics. It is a fairly feature-rich app and provides the convenience of staying connected to your blog, even when on the go. Like Weebly, WordPress has paid plans as well, but the free plan is more than sufficient for a beginner in the blogging space. Tumblr is a free and highly popular blogging platform. It is not a full-fledged blogging platform, but more of a microblogging platform. You can call it the social media of blogs. Your profile is a blog and you can create multiple posts in it. They can be text posts, image posts, video posts or mixed. You can follow blog accounts you like and their latest posts will be shown in your feed. That makes discovering new content very easy. 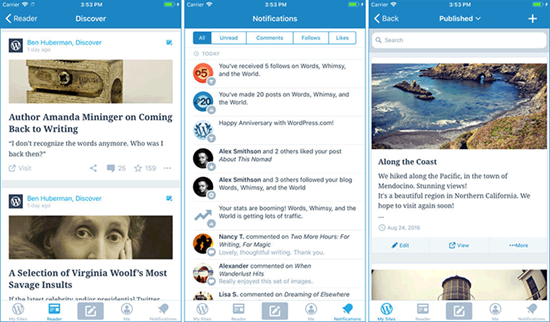 It has an mobile blogging app on iPhone or iPad for you to easily enjoy the world of blogger. Every post written needs to be shared. And Hootsuite allows users to do just that from iPhone or iPad. 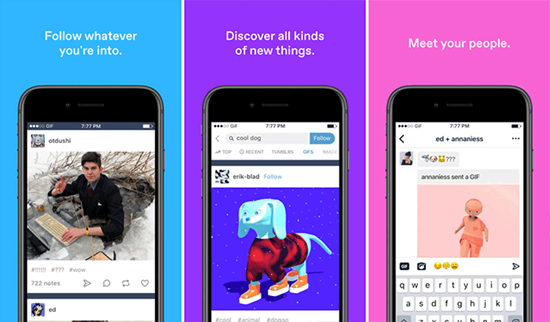 It enables users to post your latest blogs to all your favourite social networks using just a single app. It also has AutoSchedule functionality that allows messages to be sent out over a definite number of days. You can specify the date and time when some messages should be sent to your social networks. 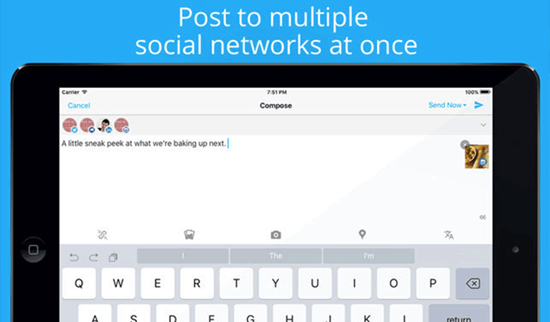 There is a free version that allows users to use up to 3 social network accounts. For beginners that is more than enough to target the 3 major social networks. There is a Hootsuite Professional plan available as well for $29 USD per month which removes all restrictions. Weebly is a very popular and easy-to-use platform to start a blog. With this platform, creating a website, blog or onine store is incredibly easy. There is a built-in website builder with drag-and-drop options. It hosts websites on its servers and also provides the ability to add custom domain names. You also get HTTPS connection for your website. The website is responsive and is beautifully designed for use. It also offers mobile apps for iOS users. The iPhone app is very beautifully designed and offers a lot of functionalities in the app itself. You can create new posts, respond to comments or monitor real-time statistics of your blog. Though Weebly offers paid monthly plans with additional options, the free plan is more than sufficient to start blogging. 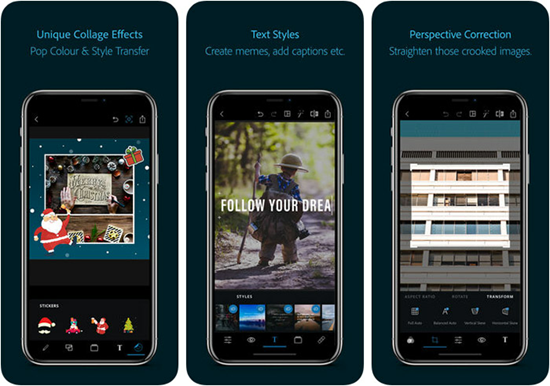 You might be wondering why an image editor app is listed in the blogging apps list. This is because blog posts also use images, and the Photoshop Express app by Adobe is one of the best apps to use for photo editing on iOS. It allows users to crop, enhance and edit images in any way desirable. And what’s more, it is completely free to use. Blogger is a very popular and completely free blogging platform provided by Google. Since it is by Google, you can start a blog with your own Google account and get access to many Google products easily. You can upload unlimited photos and videos and you need not worry about anything. However, its mobile app is very basic and barebones. This is disappointing since Google makes very amazing mobile apps. And now we have an alternative for that – “BlogTouch Pro”. Whether it’s publishing a new post, editing an existing one or moderating comments, this app handles everything with ease. The app, however, is not free and costs $4.99 on iOS platform. But we feel its a worthy one-time price to pay if you are going to use blogger for your blogs. Squarespace has been very popular when it comes to blogging. It offers a great many options and tools to create a very good blog. It also offers an iOS app that goes by the name of “Squarespace Blog”. 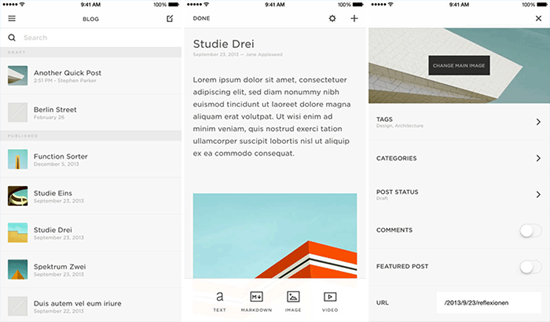 It is simple, but very effective blogging app for iOS. 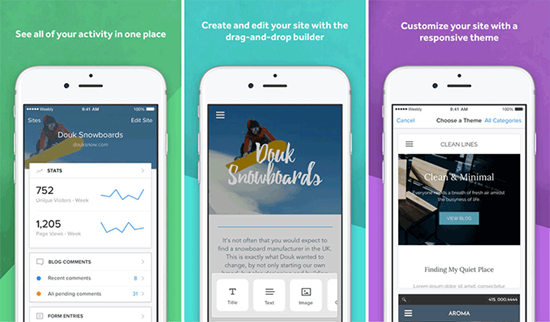 It lets you format text, create links, add photos and desired layouts effortlessly to your blog from your iPhone or iPad. Apart from that, you have the regular option of new posts, comment moderation and tracking blog stats. It is also free to use. 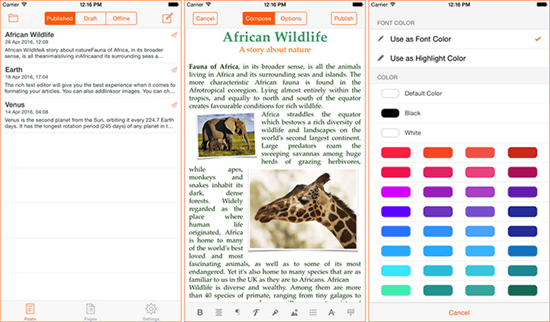 Cube is another free option in the sea of blogging platforms for iPhone and iPad. However, it is somewhat different from other options. It is designed for those who want blogging to be fun-loving and less complicated. You can simply write a blog on any topic that interests you and then share it with your friends. This is another iOS app that allows users to manage multiple blogs of multiple platforms from one single location on iPhone or iPad. Of course the regular features of new post creation, managing posts and statistics are present. But apart from the usual bells and whistles, the app also has support for offline mode which is really handy when there is no internet connectivity. It also has support for HTML editing of the posts, something most apps lack. It is also free to use. 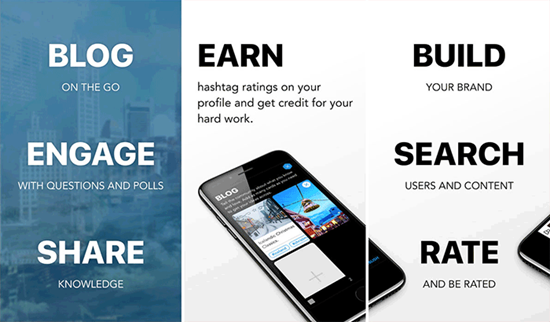 Blogo is basically a blog editor app that allows a bloggers to create, edit and manage their blogs. It has a very intuitive UI and has a host of handy features that help bloggers perform many tasks swiftly. With the offline mode, one can easily continue to work on an article even when there is no internet connectivity on iPhone or iPad. It is a free app with a paid pro version having advanced features. Blogging is a great way of expression and communication. 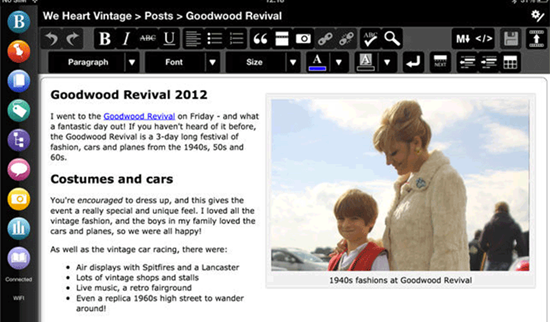 And with dedicated apps for iPhone and iPad, it has become even easier to create a blog and then manage it. 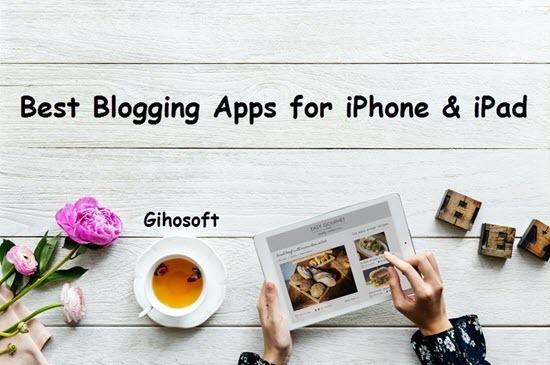 Above, we have shared a list of best blogging apps that you can use to run a blog using your iOS device. We hope this list will be beneficial to you. We hope it will help you start your blog in no time, and also help manage it better. If you have any question or suggestion, welcome to leave a message below.